HEVC/H.265 movies are popular due to its high-definition video quality, many people buy or download HEVC/H.265 movies to watch them on Smart TV, we can get better visual enjoyment. Actually, the h265 standard simply has not yet been adopted by Apple, Adobe or any of the other of the software industry leaders. So if you got some H.265 files, how to import H.265 to Final Cut Pro? Follow this guide and go on your movie director experience. From FCP official product page you will know that the native supported format of FCP is Apple ProRes codec MOV format, the other formats will not be natively supported by FCP, in this case, the best way to import HEVC H.265 files to FCP for editing is to convert HEVC H.265 to FCP Apple ProRes codec, and then you can edit the videos with FCP smoothly. Thus here we should learn about Final Cut Pro Supported Video Formats. Actually, It is not so easy to find an excellent HEVC H.265 to FCP Converter, on the market most converters can’t support HEVC H.265 codec and Apple ProRes codec, but please don’t worry about this, now we want to introduce a powerful program that can deal both codecs, the software is UFUSoft Video Converter for Mac – Which can help you transcode H.265 to ProRes 422 .mov for FCP on Mac easily and quickly. Here is review. What’s more? 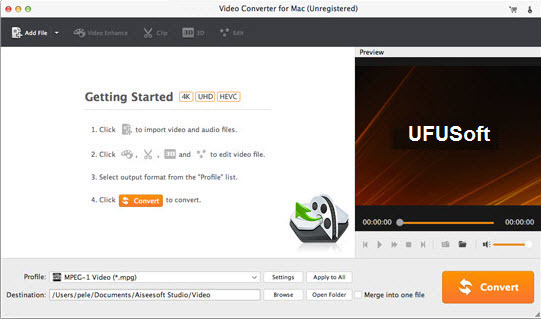 The program is an ideal Mac 4K Video Converter for fully supporting H.265/HEVC codec and transcoding H.265/HEVC codec to MOV without quality loss. Meanwhile, besides H.265/HEVC, it is also able to deal with other common videos from camcorder or internet including MXF, MTS, MKV, MP4, AVI, WMV, MOV .etc. It also offers the optimal profiles for Avid Media Composer, FCP, iMovie and more. Download the program to start the H.265 to Apple ProRes 422 MOV conversion task. How to Convert H.265 Video files to ProRes MOV for FCP? Install and run the best H.265 to ProRes converter and transfer your 4K H.265 recordings to the program.Batch conversion is supported. Click the format bar to target “Apple ProRes 422(*.mov)” under “Final Cut Pro” option. Apple ProRes is the best suited editing codec for FCP. Step 3: Optimize output profile parameters. Open “Profile Settings” window to adjust the output video codec, size, bit rate, sample rate and audio codec, sample rate, bit rate and channels according to your own preference. Hit the convert button, it will start converting H.265 to ProRes .mov for importing to Final Cut Pro 6/7 and FCP X immediately. Soon after the conversion, just click “Open” button to get the generated files for natively editing in Final Cut Pro perfectly.